Naturally, it's easy to get bitten by the wine bug when you're in such close proximity and that's what happened. Michael and his wife Gale purchased prospective vineyard land in 2004 and they began planting their "In the Rocks" vineyard site a year later. They were able to enlist the assistance of Christophe Baron, a young French fellow who owns the Cayuse winery. 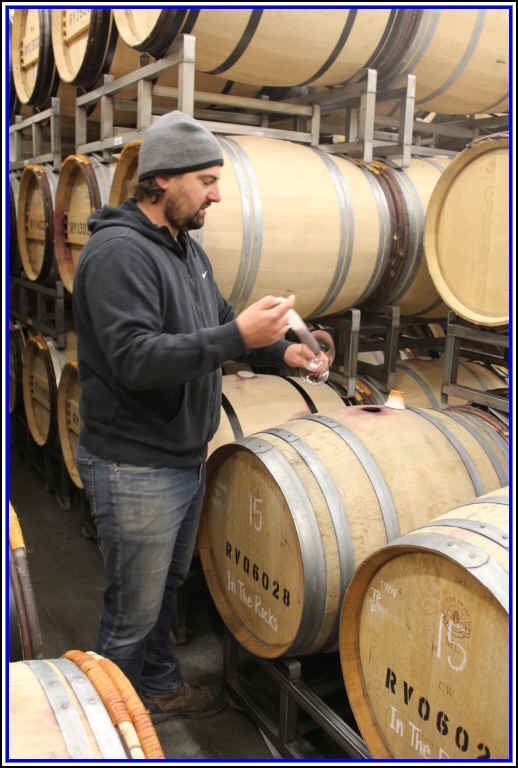 Today Michael and Gale's son Matt is the winemaker for the business. In fact, the first vintages have been vinified at the Cayuse winery, with 2010 being the first vintage they were in their own "home." 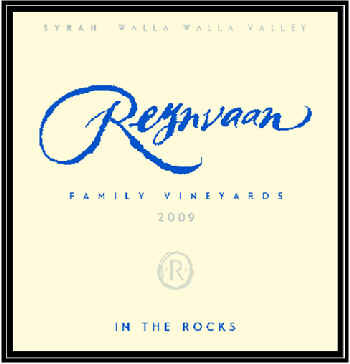 We found their 2009 "In the Rocks" bottling of Syrah to be a profound bottle of wine and this, for us, put Reynvaan "on the map." Since then the wines have continued to be stellar. Matt's sisters have enlisted him to help in making wines for their own label...one that's certainly whimsical and priced at a more affordable level than the Reynvaan bottlings. It's called "Result of a Crush" and we have a rather charming little red in stock. This is from the 2012 vintage and they've made it primarily from Syrah with a bit of Cabernet Sauvignon and a drop, or two, of Viognier. 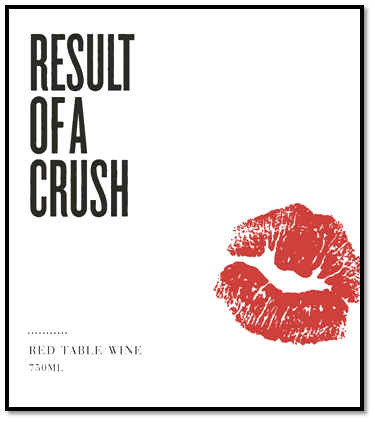 Result of a Crush Red Table wine displays medium intensity and it displays some black pepper notes on the nose. We find it to be quite good and certainly in the same range of quality as most of our Southern Rh�ne reds and good Crozes Hermitage or Saint Joseph reds. It's smooth enough to serve at cool cellar temperature. Probably best in its youth rather than cellared, too. Ron Coleman is a former Bay Area resident who emigrated (some say he was deported) to Washington. He worked at Walla Walla's Waterbrook winery, as well as Canoe Ridge. In 1998 he and Mrs. Coleman jumped in with both feet, starting their own winery, Tamarack Cellars and made 300 cases of wine. These days, Tamarack produces 20,000 cases of wine. The winery operated out of an old fire station, located on an old World War II army base. 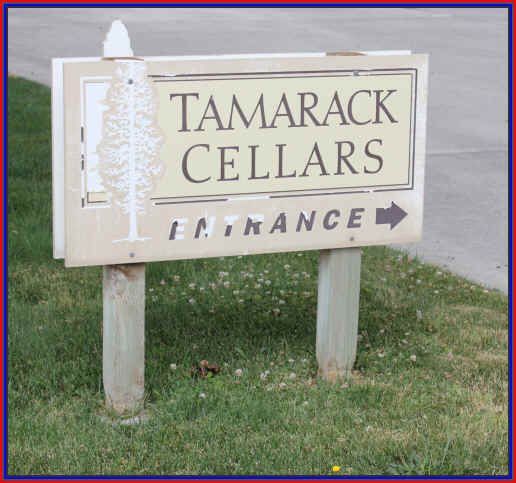 Now that building, having been outgrown for Tamarack's wine production, is their tasting and sales facility. The wines are still made "at the airport" in Walla Walla, though. We presently have a few Tamarack wines. We currently have a 2013 "Firehouse Red" from this winery. It's a nice blend of 11 different grape varieties, so there's everything but the kitchen sink here. It's Cabernet Sauvignon with Merlot, Syrah, Cabernet Franc, Petit Verdot, Sangiovese, Grenache, Counoise, Mourv�dre, Malbec and Cinsault. The wine is matured in a surprisingly high percentage of new oak. It goes into French, American and Eastern European cooperage. The resulting wine is a medium-bodied, nicely supple red that's ready to drink. We like the brown spice notes from the wood. It's a showy, little blended red. 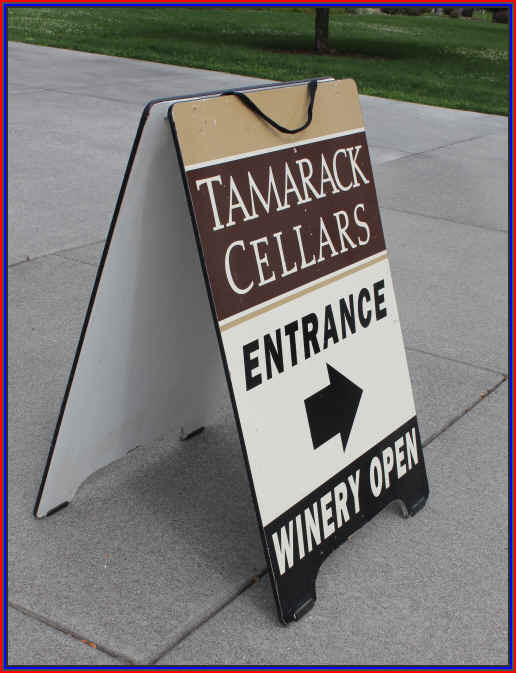 The 2013 Tamarack Columbia Valley Cabernet Franc is a medium-full bodied red mostly coming from a vineyard in the Wahluke Slope appellation with 14% coming from two Red Mountain sites. The wine is made entirely of Cabernet Franc...no other Bordeaux "cousins" are part of this wine. They matured it using a variety of French cooperages, with 20% of the oak being brand new. You'll find nice, ripe, dark fruit notes of the Cabernet Franc (that is to say, it's not vegetal or herbal) and the cedary notes from the wood are quite pleasant and balanced in our view. The 2013 Tamarack Columbia Valley Merlot is maybe our best bang-for-the-buck Merlot. 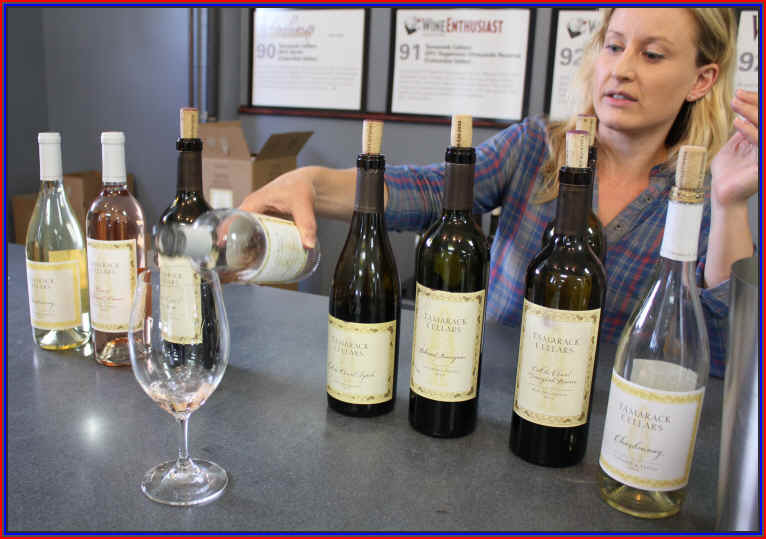 It comes from seven vineyard sites up and around the Columbia Valley appellation, including fruit from Walla Walla, Red Mountain and the Wahluke Slope. They do a cold soak prior to initiating the fermentation to try to coax greater color and flavor from the grapes. The wine goes into barrel to finish its primary fermentation and it undergoes its secondary, malolactic fermentation in wood. They age the wine in 50% new oak, with American barrels dominating the mix. Each individual lot is aged for about a year before they assemble the master blend for this wine. 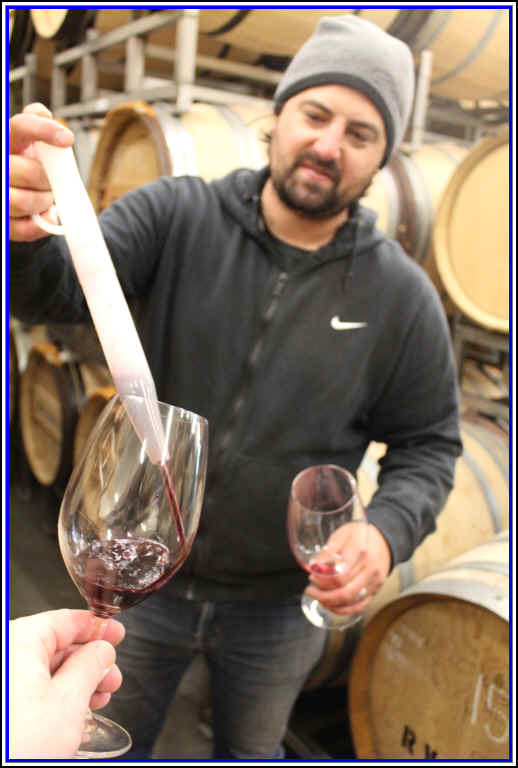 Eight percent Cabernet Franc and 2% Cabernet Sauvignon add some color, character and complexity to the wine. We think it stacks up quite handsomely to California's Merlot bottlings and it's a good bit more charming than most Bordeaux wines in this price category. 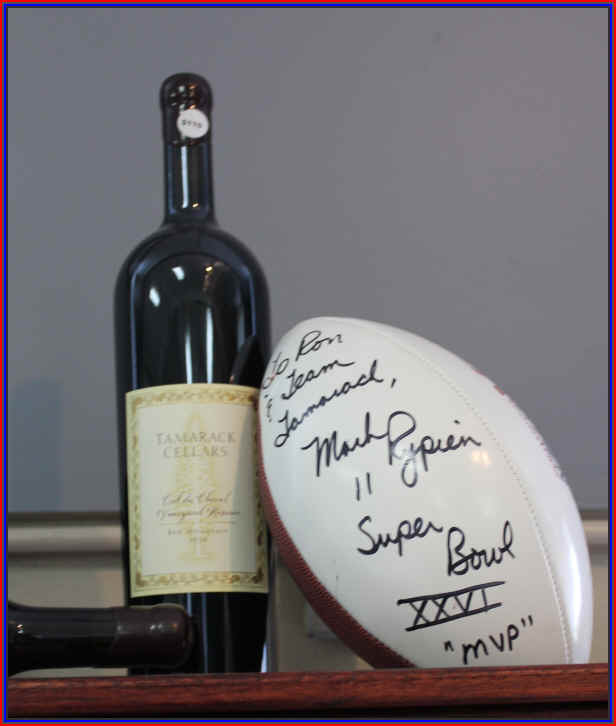 A signed football from former NFL quarterback Mark Rypien, who grew up in Washington State and went to high school in Spokane. Rypien played college ball for Washington State University and was the Superbowl MVP for the Washington Redskins. They have a nice line-up of wines to pour for visitors at the cellar door. That's the famous Katie Sadler, by the way, a former Livermore Valley (California) wine luminary. I'd guess not many people have even heard of Quilceda Creek and probably even fewer have ever tasted the wine made by the Golitzin family. Yet most of America's wine writers have sung the praises of this little winery for many years. The Golitzin's started in 1978, encouraged by Alex's uncle, the famous BV winemaker, Andre Tchelistcheff. Golitzin worked for a paper company before becoming one of the least-known, best Cabernet makers in the country. The winery is just a short drive, depending upon traffic, outside of Seattle. Vineyard sources, however, are in the Columbia Valley. Golitzin uses French oak, though, apparently they used American cooperage to a degree a few years ago. I believe they blend a small amount of Merlot into their Cabernet. We have had a few vintages of their Cabernets in the shop. These are lovely wines, showing medium-intensity cassis notes and some cedary, oaky fragrances. The tannin level is a bit high and many view these as "old school"-styled Cabernet. Given the fairly high levels of tannin in the wines when they are young, we've wondered if those offering assessments of these have given them "extra credit" for having the perception of being age worthy. On those hundred point scoring systems, there is a category which says that a wine having aging potential is, for some reason, superior to wines which are immediately drinkable. As a result, we believe, some vintages of Quilceda Creek Cabernets have earned very high scores buoyed by the tannic structure of the wines. Currently there are a few Quilceda wines in the shop. 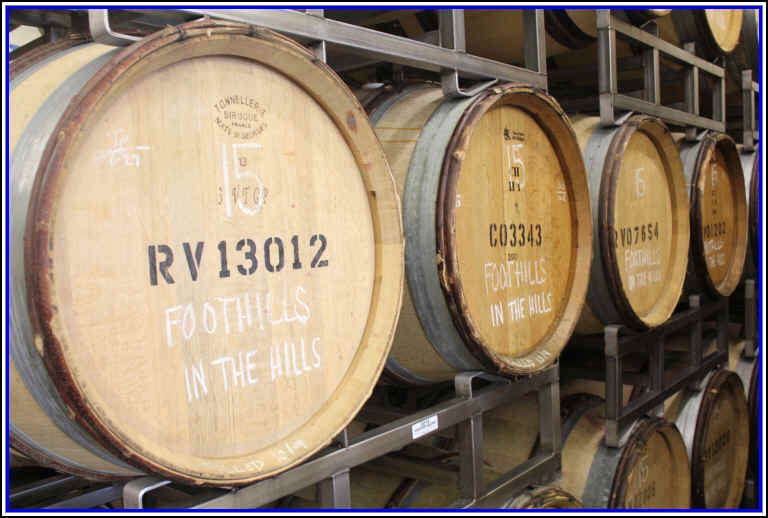 The CVR is a selection of barrels which were omitted from the Cabernet bottlings. It's predominantly Cabernet Sauvignon with 14% Merlot, 6% Cabernet Franc, 4% Petit Verdot and 3% Malbec. Matured in French oak, we didn't find the wood particularly noticeable when we tasted this. Andrew would be the nephew of Chris and Anne Camarda and Will would be their son. Chris worked in the restaurant business for about 20 years, always in places which had an emphasis on wine (was he telling me, then, he didn't work at the drive-through window and didn't have to ask each and every patron, "Would you like fries with that?"). Living on Vashon Island near Seattle, he embarked on a home winemaking project in 1987. "It was awful!" Chris recounts. Good thing this wasn't the same as sailing out of an airplane and operating a parachute. Camarda made something he considered palatable in 1988. "I thought, 'You know, this is really good!" Encouraged by this, he got a license and started making wine on a small, but commercial scale. Now he's a world famous winemaker, having been praised by eno-scribes from around the planet. Merlot and Cabernet are the specialties here and Camarda offers a number of single-vineyard bottlings. In our blind-tastings the Andrew Will wines have fared reasonably well. Camarda's wines are not heavily oaked, nor are they hugely monstrous wines, so they've not aced out Leonetti or Duckhorn, for example. Tasted away from a crowd of wines, his show good fruit and a nice balance with the wood...a world away from the sweetly-wooded Leonetti wines. His proprietary red is called "Sorella," the Italian word for "sister." This is a blend of Cabernet Sauvignon with Cabernet Franc and Merlot. We have some older vintages in the shop presently. Stone Cap is a label made by the Monson family at Goose Ridge near Benton City and Richland. The family has been farming in the Columbia Valley for many decades, but it was only in the year 2000 that they began making wine. 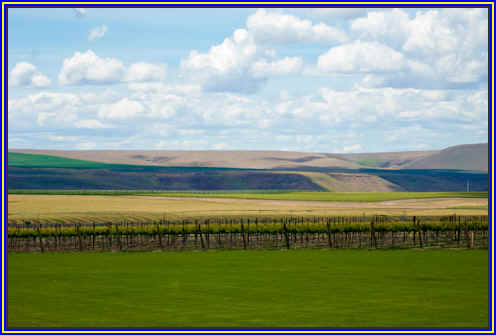 The vineyards comprise 2200 acres and it's the largest single contiguous vineyard property in Washington State. With so much fruit at their disposal, they can devote some fruit to a value-driven brand. We've tasted a couple of vintages of this Stone Cap brand and recently picked up their 2014 vintage of Merlot. It's blended with 14% Syrah and 10% Cabernet Sauvignon. Thirty percent new oak, which is remarkable for a ten buck red. We find a touch of coffee and mocha in this everyday red wine. It offers remarkable value and we offer case discounts, too. Ten bucks doesn't buy you even a tasting at numerous Napa Valley wineries...here you can have a rather nice bottle of red.